The functionalities of the app, both the GPS locator and the emergency button, are completely free. Does Safe365 work anywhere in the world? Yes. Safe365 is free anywhere in the world. Coverage in land areas of is full and coverage in sea areas is partial, where it only covers coastal areas. The free emergency service is available throughout Spain and Andorra. 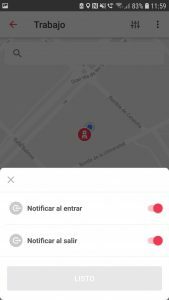 In the rest of the world, in case of emergency, the application will send an emergency alert to notify family members about their protegee’s exact location. Does Safe365 work without mobile data activated? If your mobile data is deactivated, Safe365 will only be able to send an emergency alert via SMS. In Spain and Andorra, in case you have no Internet access (no WiFi or mobile data), if you press the emergency button, your position will be sent to the rescue services in your area via SMS. In the rest of the countries, your position will be sent to your protectors via SMS. Can I have more than one phone number in the same profile? Nowadays it is not possible to link more than one phone number to the same profile. If you often use more than one SIM card, you must create a user account for each card you have, so Safe365 can locate all the devices that have one of your SIM cards. Once Safe365 is downloaded in your phone, drag it from the application panel to the initial screen. It is advisable to put it in your dock. If not, on the first page that opens when you unlock the phone. This way, in case of emergency, you won't waste your time looking for the application. Our recommendation for you is to place Safe365 in the Dock of the iPhone, next to the applications that you use the most or the most important ones. If not, putting it on the first page of your applications is also a very good choice. Above all, we recommend you know where it is located to, in case of emergency, access it as soon as possible. Nowadays it's not possible to link more than one phone number to the same profile. If you often use more than one SIM card, you must create a user account for each card you have, so Safe365 can locate all the devices that have one of your SIM cards. Our recommendation for you is to place Safe365 in the Dock of the iPhone, next to the applications that you use the most or the most important ones. If not, putting it on the first page of your applications is also a very good choice. Above all, we recommend you to know where it is located to, in case of emergency, access it as soon as possible. In what languages is Safe365? Safe365 has its application translated into 7 languages: Spanish, English, Catalan, Italian, French, Portuguese and Hindi. The language setting is pre setted according to the language in which each device is located. That means, if you have the device in Catalan, the application will automatically be set in Catalan. If you change your language's device to English, the same application will work in English. How can I see my daily activity in Safe365? Knowing the distance you have walked during the day is possible thanks to Safe365. This functionality is very useful to control how much you, and your protegee, have walked throughout the day and see if you lead an active lifestyle or not. In order to Safe365 to show you this information you must connect the App with Google account. To do this, access 'My Safe365' (Android)/'My Security'(iOS), click on the three dots of the top menu, enter 'Permissions' and touch 'distance' (android)/'Physical Activity' (iOS). Once this is done, the distance you have walked will appear on your file and you could see all your, and your proteges, activity. Can I register in Safe365 without having a Facebook account? Yes. At Safe365 we use Facebook Account Kit as a platform to validate profiles. Is not necessary to register or enter at the application trough Facebook, nor to have a Facebook profile. What is the Facebook Account Kit? The Facebook Account Kit is a security system created by Facebook which any developer can add to its application and it allows you to log into applications such as Safe365 via email or the user's mobile phone number. Once one of these two has been entered, the system sends a temporary code that must be used by the user to verify his identity. From then on, it will be possible to start using Safe365 without problems. The Facebook Account Kit supports more than 230 country codes and it's available in more than 40 languages: you can see a complete list here. They plan to add more countries in the future. What does the green circle indicate? In the map where all your protegees appear, you can see a green circle that sorrounds them. The green circle indicates the area in which your protegee is located and the accuracy of the location. That is, the smaller the circle is, the more precise the location is. If, on the other hand, the circle is bigger, the quality of the signal is worse and Safe365 will give you an approximate mark of the area that your Protegee occupies. The accuracy of the signal is obtained through the mobile device. The device uses your GPS and your internet connection to determine your location. Is Safe365 designed just for seniors? 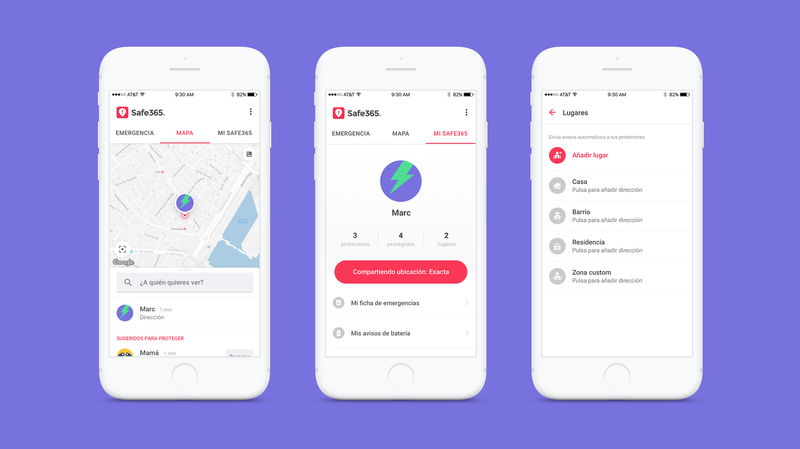 Although Safe365 has been designed to be a safety locator for the elderly, it is open to any type of audience that can adapt the app's functionality to their needs. For example, it can also serve as a GPS locator for children, in case families want to know their kids location when they return only from school. Safe365 is a mobile app (available for iOS and Android) designed to improve the safety of your family and friends. 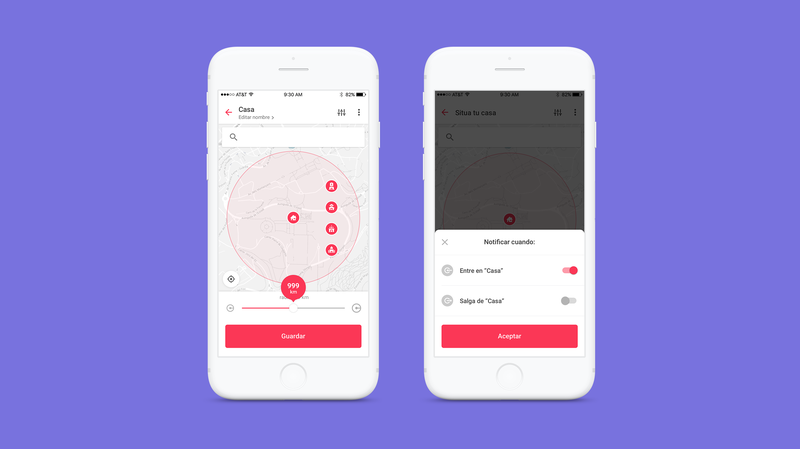 With this GPS locator you’ll be able to know the location of the people you want, with their consent, in real time: if they go for a walk in the neighborhood, if they enter or leave their home, if they have arrived at work… Basically, you’ll be able to know they are safe. If anything happens to them, Safe365 also includes an emergency button for them to press in case of need. 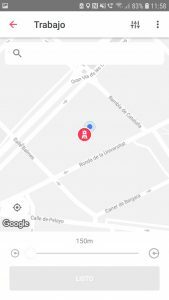 If you are in Spain or Andorra and press the emergency button, the app will directly contact the rescue services, and will send them your accurate location. In the rest of the world, Safe365 will immediately alert their Protectors. The app has other functionalities, such as sending automatic notifications when your Proteges enters or leaves a certain area, know the routes of your Proteges and warn you when their mobile devices are running out of battery, if they are static or moving, whether they have or not Internet access, etc. What happens when I ask for help by pressing the red button? When you press the red button, in Spain and Andorra you will receive a call from our center specialized in emergency management. Currently, Safe365’s services are integrated with 112 of Euskadi, La Rioja, Aragón, Galicia and Extremadura, and with the RACC operators in the rest of the autonomous communities. In Andorra, you’ll be attended by the firefighters service. It is important that you only use the button in case of real need, because by doing so the emergency services will activate your rescue immediately. Once the alert has been resolved, your Protectors will be also reported. They will not be warned beforehand to avoid repeated communications with the emergency services. In the rest of the world, when you press the button, a geolocated emergency warning will be sent to all your Protectors. Is it possible for Safe365 to send alerts without my consent? Safe365 doesn't send emergency alerts automatically. Neither it does it without the consent of the user. Is the 112 who answers the phone? In Spain, it depends on the autonomous communities. Currently, Safe365’s services are integrated with the 112 of Euskadi, La Rioja, Aragón and Extremadura. For the rest of the areas of Spain, the emergency reception center calls you after you press the red button and manages your rescue if necessary. If you are in Andorra and press the emergency button, you will be attended by their firefighters service. What happens if I press the red button by mistake? 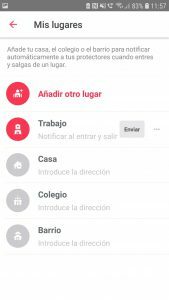 In Spain and Andorra, the emergency center will get in touch with the emergency contacts that the user has previously pointed in the app. In the rest of the world, your Protectors will be warned by you, so they can get in touch with the emergency services. What happens if I need help and use the panic button but I can not answer the call? 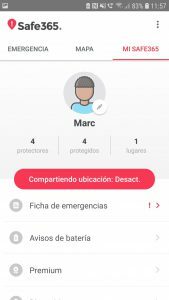 In Spain and Andorra, the emergency center will get in touch with the emergency contacts that the user has previously pointed in the app.In the rest of the world, your Protectors will be warned by you, so they can get in touch with the emergency services. Can I use Safe365 to report an emergency in which I am not affected? In Spain and Andorra you can report an emergency even if you’re not affected, but you will have to be physically present in the same place where the emergency occurs. In the rest of the world, when you press the red button, a geolocated emergency warning will be sent to your Protectors. Can I try the emergency button? Currently, in Spain and Andorra we do not have any test mode. Also, in the case of pressing the button by mistake, we will ask you if you need help to confirm that you need assistance. In the rest of the world, you can try if the button works because the emergency warning will be received by your Protectors. If I press the emergency button, will I also notify my Protectors? If you press the emergency button, your warning will only be notified to the emergency services in Spain and Andorra. In the rest of the world, your Protectors will receive a geolocated emergency alert at the moment you press the button. A Protege is the person you want to protect with our GPS locator. You can add them in "Add to see on the map" or from My Safe365 > Protege > Add. If I press the emergency button will I notify my Protectors? If you press the emergency button, in Spain and Andorra the warning will be received by the emergency services, but not Protectors. The Protectors will be notified after emergency services manage the entire emergency, so protectors won't interfere in it and the incident may be solved as soon as possible. On the other hand, in the rest of the world, by the moment you press the button, your Protectors will receive an emergency geolocalized warning. How does my Protegee move? The protector can see if its protegee is moving on foot, running, by vehicle or bicycle. You can also see if it's stopped. If you don't know exactly, the app will show as unknown how your protected travels. I can’t locate one of my Proteges, why? Network is not available: their phone may not have signal. Phone off: your phone may be off or has run out of battery. GPS off: Your phone may have the GPS turned off for some unknown reason, or you may have voluntarily disabled it. If you want, you can ask Safe365 to receive an alert when your Protege is available again. How can I delete a contact? To delete a contact, go to the "My Safe365", click on Protectors or Proteges, and there you’ll be able to delete it by pressing the three points to the right of each contact. To add a contact in our app, access the map or "My Safe365", click on Protectors or Proteges. Once inside, click on the "Add..." button and select a contact from your mobile phone’s contact list. Can I see the location of my Protectors? No, you can only see the location of your Proteges. Therefore, if you want that one of your Protectors become a Protege, you can ask him for it. Can I add or remove a place from a Protege? Yes, you can add or delete a place in the Protege file, by clicking on the icon of the house on the map. You can either add the place where your Protege is at that precise moment, or add anyone else. Can I stop sending notifications to my Protectors/Proteges? If you wish, you can deactivate the entry and exit notifications of your “Places” and the low battery warnings. If you have a “Place” enabled, you can disable it in My Security> Places>”Your saved place”> Deactivate. To deactivate only the notifications of entry or exit of any of your “Places” go to My Security> Places and tap on the “Place” on which you wish to deactivate the notifications. Then, tap the button of the three-vertical-stripes in the top-right part of the surface. Deactivate the notifications of entry or exit from that place. Moreover, if you have activated the “Low battery warning”, you can disable it in My Security> Battery warning. To share a place with one of your Proteges, go to the list of places, click on the ‘Send’ button, which is to the right of the name of the area, and select a contact to share one of your places with your Protege. How can I create a Protege Profile? It will open a screen that offers you the option of “Create profile and invite”. Click and configure his profile: you can add his name, frequented areas and profile picture. Once this is done, you just have to click on invite, download the app on your phone, and everything will be ready so you can start protecting him. If you have already sent an invitation, you will have to cancel it. To do this, go to his contact and in the upper right corner you will find three dots. Click on them and select “Cancel invitation”. Can I locate a contact that I do not have added as my Protege? It is not possible to locate any contact that you do not have added as your Protege. In order to do so, you must send them a request. If you do not have Safe365 installed, you can previously invite them to download it from the same app. You can add them from the map in ‘Add to see on the map’ or from My Safe365 > Protege > Add. How can I create a place? To create a place, go to My Safe365 > Places. Once inside, click on one of the predefined zones and choose the location of it or, if you want to create another kind of place, click the option "Add another place". In your places' list, press the options button with three dots and switch the option to 'deactivate' or 'remove'. 'Deactivate' mutes incoming and outgoing notifications. 'Delete' will completely erase the area. To share a place with a Protegee you must go to the list of places. Once there, click on the "Send" button at the right of the area's name and select a contact to send it. Home / School / Work: you can define a neighborhood for each of your proteges, with a radius of between 300m and 1km. Neighborhood: you can define a neighborhood for each of your proteges, with a radius of between 300m and 1km. Custom zones: you can define up to five personalized zones for each of your proteges with a radius of up to 10km. Altogether, each user can create up to 9 different places. Yes, you can add, edit, or remove a place inside the file of your Protege. taping on the little house icon at the bottom-right corner. How do I change my name, email address or profile picture? To change your profile information, go to "My Safe365" and click on your avatar. Once inside you can modify all the fields you need. Where can I add my allergies, diseases, etc.? To add additional information in your Emergency File, go to "My Safe365" and there you will find a field to fill in what you want. Can I change the language of the app? The language of the app will be the same as the one you have configured on the phone. The supported languages are Spanish, Catalan, Galician, English, French, Italian and Portuguese. The default value for other languages will be English. To delete your Safe365 account and all related data, go to "Settings" and there you will find the option to "Delete account". To share it with your protectors and 112 in case of emergency. 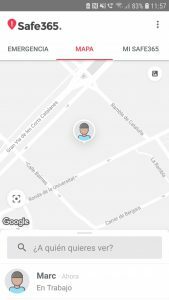 In order to add your contacts on the map and connect easily with your family and friends. That's why Safe365 request you to import your contact list. To make a selfie for your profile picture. To choose a picture for your profile picture to recognize you more easily. To be able to send your location in case of emergency with a simple call to 112 and to your Protectors/Protegees. To know the distance you do on a day and sharing it with all your protectors adding your Google account. To accept all the permissions, in case you didn't, you can do it at Settings>Permissions. Can I keep sending notifications every time I enter or leave one of my places, even though my GPS locator is no longer activated? Yes, every time you enter or leave one of your places you’ll keep sending a notification to your Protectors, even though your GPS locator is not activated. To activate this kind of notifications, you can go to My Safe365 > Places and click the Place you’re interested to activate. Then, press the three vertical lines button and activate the notifications. Do I still send notifications even though I don’t have the GPS locator activated? Yes, if you have one of your places activated, your Protectors will still receive notifications every time you enter or leave the place, even though you don’t have the GPS locator activated. To activate it, go to My Safe365 > Places > … > Activate.You can also decide if you want either want to send notifications as you leave or enter your places. To do so, go to My Safe365 > Places and click the Place you want to activate or disable this notifications. Then, press the three dots button and activate or disable the enter or leave notifications. Can I stop sending notifications to my Protectors? If you wish, you can disable the entry and exit notifications of your Places and low battery warnings. If you have a Place activated, you can disable it in "My Safe365" > "Places" > ... > "Disable". To disable only the notifications of entry or exit of any of your Places, go to "My Safe365" > "Places" and click on the Place on which you want to deactivate the notifications. Then, press the button made by three vertical dots in the upper right part of the interface and disable the notifications of entry or exit from that Place. Also, if you have activated the low battery warning, you can deactivate it in "My Safe365" > "Battery warning". How can I erase the persistent notification? You may see: "Sending your position to your protectors" on your notifications bar. To disable it, you must have, at least, an Android 8.0 (Oreo) version. To do this you must go to your phone settings, tap Applications> Safe365> Reminder, and you must disable "Allow Notifications". Do you keep my location data in your registers? Yes, we register your location data to be able to provide it to the emergency services in case of need. This information will only be used in case of emergency. The GPS is oriented to open spaces with a clear view of the sky to connect with satellites. If you are inside a building, we recommend you to improve the accuracy to avoid any kind of problems. To do so, go to Settings > Location mode > High Accuracy. The margin of accuracy of the positions obtained with Safe365 can vary up to 150 meters maximum, so there is a possibility that you can see your location a bit displaced from the exact point where you are. Therefore, if you are inside a building, we recommend you to improve the accuracy to avoid any kind of problems. To do so, go to Settings > Location mode > High Accuracy. Which types of locator can I use? Approximate location: Protectors will be able to know the location of their Proteges in a radius of 200 meters of distance in real time. Accurate location: Protectors will be able to know the exact GPS location in real time. Route: Safe365 will be drawing on the map a route with all the trips made by the Proteges during the day in real time. If you don’t want to share your location, you can also disable it for any time you want. To select your location preferences, go to the My Safe365 > Sharing location to chose the different locator levels. How can I stop sharing my location? How can I close the app? To stop sharing your location, in My Safe365 > Sharing location you can disable the locator. Can I delete a route? The route can not be deleted: it is designed for the security of the Proteges. This way the rescue teams have all the Proteges’ location if necessary. Can I use Safe365 and another geolocation app as a complement? Safe365 is fully compatible with any other geolocation app and it can coexist correctly with any other apps. 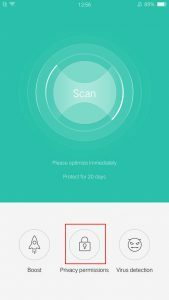 I lost my phone or it was stolen and I had Safe365 installed, can you help me find it? Although we act as a cell locator, once a device is lost / stolen, since it is not possible to verify the ownership of the phone number linked to the user account, we can not give information about its location for security reasons. How much battery does Safe365 consume? On iPhone, the app consumes approximately 20% of the battery throughout the full day (varies by model). In Android, the app consumes approximately 12% of battery throughout the day (varies by model and conditions). It is recommended that before carrying out any activity you ensure that your device"s battery is fully charged. It is also important that you turn off the rest of apps to optimize the battery life. Does Safe365 still working even though my phone device is out of battery? No, if your phone has run out of battery it will not be possible for your Protectors to know what is your location. They will only be able to see your activity during the last 24 hours until the moment when your device was turned off. How can I disable my battery alerts? The battery alerts are all the notifications that you send to your Protectors every time your mobile device has a 10% battery left or you charge it. They can be disable in ‘My Safe365’ > ‘Battery alerts’ > ‘Low battery alerts’. Add Safe365 to the secure apps list. Due to the customization layer of their devices, to save battery the system closes apps, passing them to the background, and causing some apps like Safe365 to stop working. If you want to avoid that Safe365 stops working in the background, you can do it by pressing the button of our app in the recent apps - which work in the background - and slide it down with your finger, until it is fixed in the bottom of the screen. Choose the “High Accuracy” location mode so your device can find your exact position using all available resources around you: the mobile network and the Wi-Fi network. Go to Settings or Settings> Sound and notification> Application notifications> Select Safe365> Disable the Block button to activate Safe365 notifications. Once you have done this, the block marker should be gray. Choose the "High Accuracy" location mode so your device can find your exact position using all available resources around you: the mobile network and the Wi-Fi network. Due to the customization layer of their devices, to save battery the system closes apps, passing them to the background and causing some apps like Safe365 to stop working. That is the OPPO case. If you want to avoid that Safe365 stops working in the background, you can do it by pressing the button of our app in the recent apps – which work in the background – and slide it down with your finger, until it is fixed in the bottom of the screen. 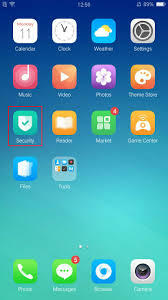 You must go to Security Center app, an standard app from OPPO. 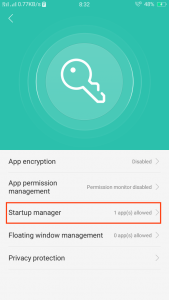 Once in there, you must tap on Privacy Permissions, where clicking at Startup Manager you will access to a screen where you have to allow the use of the app in the background. On the Notifications screen, you can choose your preference: Urgent, High, Medium, Low. From the start screen, pull down the notification bar for "Settings". Tap the gear symbol in the top right-hand corner. In Settings, tap "Data Usage". From the Mobile section, tap "Mobile Data Usage". Select Safe365 from below the usage graph. 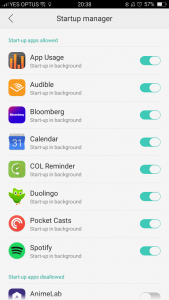 Tap "Allow background data usage" to turn it on.